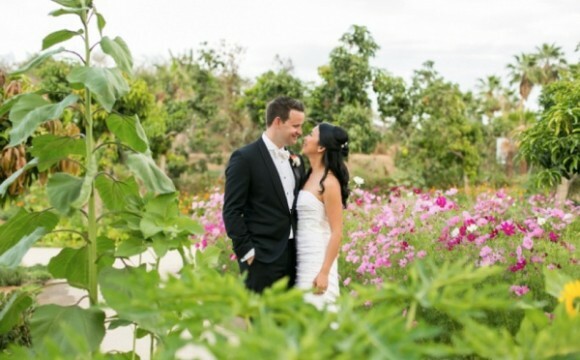 Monica and Andrew got married on a beautiful sunny day at Flora Farms in San Jose del Cabo. The sky was clear and blue, and the sun was bright and lovely, which called for light and longstanding, sun- and sweat-proof makeup. Monica imagined her makeup neutral, fresh, with rosy complexion and lips, black eyeliner and very natural false eyelashes, which I loved, because it was just a perfect combination for her beautiful fair skin. Prior to their wedding, we spoke with Monica over the phone and by email, specifying her desires for her wedding hair and makeup. Her hair is mid-back length, black and straight, and she has Asian complexion and eyes. To create her ideal wedding look - fresh, neutral, rosy cheeks and lips with some accent on the eyes - I used Urban Decay Naked 3 Palette for the eyes, which has beautiful rose-hued neutrals ranging from pale, shimmery pink to deep black matte. I also used black Bobbi Brown cream eyeliner, very natural false eyelashes and waterproof mascara. To achieve the desired look for Monica, I used the tridimensional makeup technique, which consists first in contouring, highlighting and blending. After that I applied a foundation based with yellow undertone, which is very flattering for most Asian women. And at last I used a high definition loose powder for setting the foundation and to give Monica a natural, healthy look. I used a pink tone blush from NARS to give her a natural glow - I love it because it looks especially pretty on fair skin tones. For her lips, I used the "Pink blossom" color from Bobbi Brown. For her hair, Monica wished for a relaxed ‘half up/half down’ look. We used some of her hair pins and created a look that was flattering and allowing her hair to provide a lovely frame to her beautiful face and figure. I loved the look we created for Monica! She looked gorgeous, and the most precious for me was the moment when Andrew saw Monica for the first time - he was left speechless! Much love and happiness to you both, Monica & Andrew! It was wonderful working with: Wedding Flowers: Florenta Flower Design. ~ Wedding Photographers: Ana and Jerome Photography. 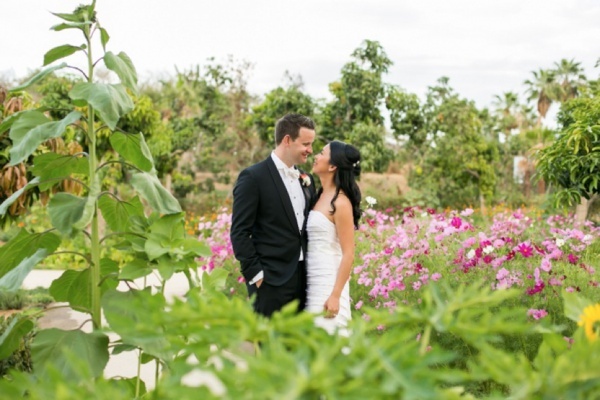 ~ Location: Monica and Andrew's wedding took place at the beautiful Flora's Farm in San Jose del Cabo. 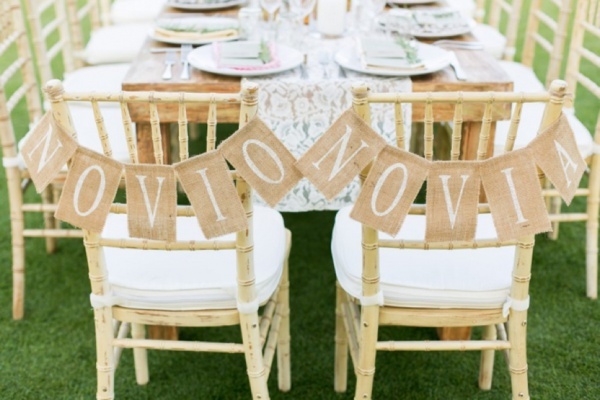 Monica & Andrew's wedding was also published on Carats & Cake.